I would start the lesson by asking the class what they think is the difference between experiencing the Holy Ghost and receiving the Gift of the Holy Ghost. How are these related? “However, there is no guarantee that the person will receive inspiration and guidance from the Holy Ghost just because the elders have laid their hands on his or her head. Each person must “receive the Holy Ghost.” This means that the Holy Ghost will come to us only when we are faithful and desire help from this heavenly messenger. Considering these passages, how do we reconcile the notion that the GIFT of the Holy Ghost provides us with constant companionship at the same time that we teach we must be worthy to experience the companionship. Is it a gift or isn’t it? Holy Ghost in response to work: Ask the class if they would be willing to share examples from their lives when they experienced the influence of the Holy Ghost in response to having made spiritual preparations to feel it and what those preparations were. Holy Ghost as Grace: Ask the class if they would be willing to share experiences from their lives when the spirit touched their lives with no preparation on their part. You could share the story of Alma the Younger as an example of how the Holy Ghost can reach us even when we seem utterly unprepared and unworthy. The Holy Ghost is an independent being who works with each of us in unique and individual ways. I think it’s useful to acknowledge that many of us, even believers, struggle to recognize and experience the Holy Ghost in our own lives. I have a very good friend, a devout believer, who seems to have an especially close relationship with the Spirit. She lives her life by the promptings of the Holy Ghost in matters both large and small and has often felt guided in every decision she’s made. A few years ago, she was dating someone and she could tell it was getting serious. She began to pray in earnest whether or not this was the man God intended for her to marry. She prayed and prayed and for the first time in her life felt utterly unmoved by the Spirit. It got so bad that she took it as a sign he must not be the right one and tried to end the relationship. But ending the relationship made her miserable. After weeks of fasting, praying, scripture reading and temple attendance, everything she’d been counseled all her life to do to gain the companionship of the Holy Ghost, she received a profound revelation: This choice is YOURS. She had a spiritual witness not that she should marry this man, but that she should decide whether or not she wanted to. She felt comforted with the sense that God would consecrate her choice but had a powerful sense that everything else was up to her. On the outside, this could look like (and indeed temporarily felt like) an absence of the Spirit guiding her life. On further reflection it is a beautiful example of the way the Holy Ghost and our Heavenly Parents respect our agency enough to let us work out life on our own when we need to. My friend did marry that man—a decade and several children later, she is still happy in her choice. What words are often used in the scriptures or in our Church culture to describe what the Holy Ghost FEELS like? Some examples your class may come up with: burning in the bosom, still small voice, whispering, peaceful, invigorating, or as Joseph Smith described, “sudden strokes of ideas.” We should be open to allowing the Holy Ghost to touch our lives in ways we may not have anticipated. “An intelligent being, in the image of God, possesses, every organ, attribute, sense, sympathy, affection, of will, wisdom, love, power and gift, which is possessed by God Himself. But these are possessed by man, in his rudimental state, in a subordinate sense of the word. Or, in other words, these attributes are in embryo, and are to be gradually developed. They resemble a bud, a germ, which gradually develops into bloom, and then, by progress, produces the mature fruit after its own kind. The gift of the Holy Spirit adapts itself to all these organs or attributes. It quickens all the intellectual faculties, increases, enlarges, expands and purifies all the natural passions and affections, and adapts them, by the gift of wisdom, to their lawful use. It inspires, develops, cultivates and matures all the fine toned sympathies, joys, tastes, kindred feelings and affections of our nature. It inspires virtue, kindness, goodness, tenderness, gentleness and charity. It develops beauty of person, form and features. It tends to health, vigor, animation and social feeling. It develops and invigorates all the faculties of the physical and intellectual man. It strengthens, invigorates and gives tone to the nerves. In short, it is, as it were, marrow to the bone, joy to the heart, light to the eyes, music to the ears, and life to the whole being. Ask your class if they can think of times when the Holy Ghost influenced their lives in ways that did not seem directly Church/testimony related. “We say that we believe that God “will yet reveal many great and important things pertaining to the Kingdom of God.” (Articles of Faith 9.) Revelation to the Church will come through the prophet, but doesn’t that article of faith make you ask questions? What are those great and important things? And who will he reveal them to? Could you be one of those who is struggling to “understand the matter, and consider the vision”? If you are, then you’re one of those worthy to receive an angelic visitor. Furthermore, the promise of Joseph Smith to the Nauvoo Relief Society on 28 April 1844 was this: “Angels cannot be restrained from being your associates.” (History of The Church of Jesus Christ of Latter-day Saints, 2d ed. rev., ed. B. H. Roberts [Salt Lake City: The Church of Jesus Christ of Latter-day Saints, 1932–51], 4:605.) Has this promise come true for you? Both Joseph Smith and Alma promise the ministration of angels to women. Yet such is the respect of our Heavenly Father for our agency that he will very rarely give us something for which we have not asked. What would happen, do you think, if we prayed for revelation, for knowledge, for the comfort of the ministration of angels? This is great. I love the quote at the end from Cheiko Okazaki. Aimee – This is great. I recently gave a talk at an adult baptism and this would have been a helpful resource. I like the story about the friend who was told “The choice is yours.” Sometimes we need to be confident in going forward, trusting that things will work out. 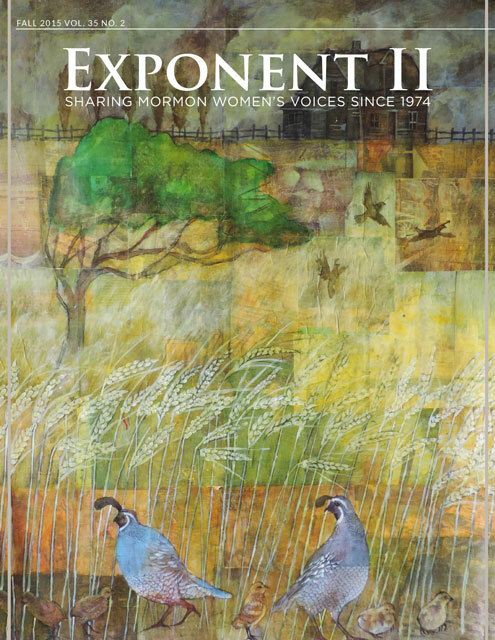 I have loved the last 2 issues of the Exponent II by the way. Thank you for doing such a fine job. Thanks for the kind note, Rebecca. As I’ve been teaching a class of new members in my ward here in Baltimore, I keep getting the sense that the Gift of the Holy Ghost isn’t producing the kind of specific guidance and inspiration in their lives they were expecting or hoping for. Figuring out a way to talk about how powerfully the Spirit really can act in our lives at the same time that we acknowledge how our Heavenly Parents respect our agency and our need to progress by figuring out our lives for ourselves can be a tricky balance. I’m glad you found it helpful. And I agree, Sandra. That Chieko quote gives me goosebumps every time I read it. I am teaching this lesson on Sunday. I found a great conference talk by Elder Bednar from April 2006 – so the May 2006 Ensign issue. The talk is titled “That we may always have his spirit to be with us.” It relates the Gift of the Holy Ghost in our lives the way the Lehi and his family had the Liahona to direct them. The liahona only worked if they where doing what they should. When they were not obediant – it did not work. Same concept with the Holy Ghost in our lives. Thank you for a fabulous website – I always come here first when it is time to give my lesson. Thanks for the Bednar reference, Stephanie. The collective resources of our readers makes finding useful sources boundless! I love and enjoy all your comments and sharing with me….I am going to start out my lesson with a brick and a rock….one that crumbles because its made of sand that blows like the wind and the other stable and firm….one made of others opinions and believing in the arm of flesh….the other believing in Christ and what the Holy Ghost knows to be true and right for you personally…..